Well, Christmas is coming nearer and its that time of the year again, where most Filipinos around the world celebrate Christmas! Christmas holidays also marks the days of feasting on traditional Philippine food at home, at a relative’s place or at a friend’s house. Filipinos love the Christmas Season because it is the perfect time to celebrate with the people who matter most. It's not my favorite food but it's one of the few foods I really like. I'm still a very picky eater. MJ's Cafe at Baypark is back on business and now open and ready to serve you with our grilled thin pizzas once again! What is MJ's? MJ's Cafe is a restaurant along Roxas Boulevard (front of Baywalk), Malate, Manila which offers Filipino-Fusion food, and has a unique grilled thin pizza offering for people. It is named after "Manong Jay" who conceptualised the restaurant in 2006, during the height of Baywalk. Manong Jay is a young entrepreneur who has traveled much and in his travels, he fused some of the tastes of these food into a Filipino dish. But the best innovation was the grilled thin pizza which currently has 5 classic flavors and 3 of his signature flavors -- Sisig Pizza, Bistek Pizza and Tinapa & Red Egg. These signature flavors are a must try! Visit the restaurant or if you are from Manila, call 475-4163. We also have a venue for parties and private functions. MJ's Café continues to offer comforting Filipino Food that everyone just loves. Like the Grilled Thin Pizza, the Filipino food menu can also be delivered to your offices or homes. The portions are good for sharing, but there are rice meals as well for single portions. The rice meals are priced just right, and they are: MJ's Famous Tender Pork BBQ Rice Meal, which has two sticks of the tender pork barbecue with rice priced at Php 60.00; The Breaded Fish Fillet Rice Meal, priced at Php 80.00, and: The Grilled Liempo Rice Meal priced at Php 85.00. 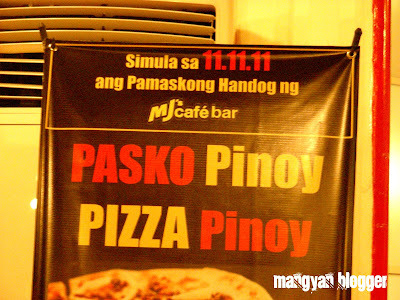 Paskong Pinoy is just around the corner, and like every year, Filipinos know how to make the season extra festive. As early as September, Christmas decors are out and Christmas songs are playing on the radio. People are looking forward to cool weather and the Christmas food such as hams, chestnuts and many more are very much looked forward to. Companies ready themselves for parties and giving the bonuses. Families and friends get together for reunions or simply spend time over food – either in restaurants or in the comforts of their homes. To celebrate the coming season, MJ’s Café Bar, which is a trade name of JEN Food Inc. gives an early Christmas present to its customers through Pasko Pinoy, Pizza Pinoy, which puts its three famous signature flavors of their Grilled Thin Pizzas on Buy 1 Take 1 promo. The three pizzas under this promo are the Sisig Pizza (Php 335.00), the Bistek Pizza (Php 300.00) and the Tinapa & Red Egg Pizza (Php 260.00). This Grilled Thin Pizza is a unique MJ’s Café recipe. The restaurant is located at Baypark along Roxas Boulevard Service Road, Malate, Manila and specializes in Filipino Fusion food along with its Grilled Thin Pizza line. MJ’s Café is suitable for dine-in, take home and deliveries. It can also serve as a party venue for a minimum of Php 5,000 for three hours consumable on food and drinks. For inquiries, you may call 475-4163 ; informations and updates like MJ's Hand-rolled Grilled Thin Pizza on Facebook or visit http://www.mjcafe.ph/. Followed you hope you return the favor!